Aim: The aim of this study was to evaluate the accuracy of two different apex locators for working length determination during root canal retreatment of mandibular molars in an in vitro study. Method: Sixty extracted mandibular first molars with separate mesial canals and apical foraminae and one distal canal were selected. The mesiobuccal and distal canals were investigated; the length with the file tip at the major diameter was defined as the tooth length (TL). The canals were prepared with ProTaper files to 1 mm short of this and filled with gutta-percha and AH Plus sealer. One week later, the root fillings were removed using ProTaper and M2 retreatment files. Tooth length was remeasured and recorded as the retreatment tooth length (RTL). Then electronic measurements were taken at the major (electronic apex locator (EAL) major) and minor (EAL minor) foraminae with Root ZX and Apex ID apex locator as suggested by the instrument display. These lengths were compared with RTL and measurements 0.5 and 1 mm short of this distance. Results: For both canals, no significant difference was found between RTL and EAL major, and 0.5 mm short of RTL and EAL minor with Root ZX apex locator and protaper retreatment files. There were significant differences found between Apex ID apex locator with M2 retreatment files readings. 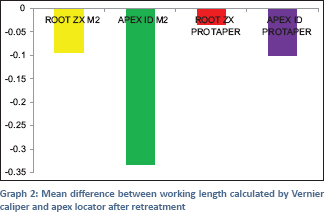 Conclusion: Root ZX apex locator was more accurate as compared to Apex ID apex locator in determining the working length in teeth after removing the root canal obturating material. Working length plays an important role during endodontic treatment. It helps in complete removal of the debris from the canal and is considered to be the most critical juncture of successful therapy. Canal preparation is ideally done and filled to the minor foramen which is considered to be the narrowest point of the canal. At this point, there is a minimum blood supply and has innate repair potential. There are various methods for determination of working length out of which radiographic is generally accepted. This method has a disadvantage that it cannot determine the apical constriction, but with the introduction of the electronic apex locators, this problem can be solved as it works on the electronic principle and can determine the treatment and retreatment working length up to the minor foramen. This study aims to evaluate the accuracy of Root ZX and Apex ID apex locators for retreatment working length determination in the molar root canals. The present study was conducted in the Department of Conservative Dentistry and Endodontics at Bhojia Dental College and Hospital. The study sample constituted of 60 extracted mandibular first molars. Teeth with three canals, morphologically normal and no evidence of fracture or resorption were included in the study while teeth with carious roots, external or internal root resorption, open apex roots were excluded from the study. With the use of ultrasonic scaler, external debris were removed. Expeditious bur (Mani, Tochigi, Japan) was used for access preparation and Endo Z bur (Dentsply Tulsa Dental Specialties; Tulsa, Oklahoma) for refinement was used. Decoronation was done at the cementoenamel junction following access preparation, as it provides a stable horizontal reference point for measurement of working length. Size #15 K-file (Mani, Tochigi, Japan) was used for pulp debridement. Irrigation protocol was followed using 3% sodium hypochlorite (Dentpro, India). ×2.5 loupes were used for calculating the length of mesiobuccal and distal root with 15# k file which was advanced until it appeared at the apical foramen. Silicon stop was accustomed at the reference point, and the length between stop and tip was calculated using Vernier Caliper to the nearest 0.5 mm. After repeating measurements for three times by two individuals, their mean value was calculated. This length achieved is called as tooth length (TL) and after deducting 1 mm, the length established is the working length. Protaper files were used for biomechanical preparation. For working in the middle third of the root, shaping files S1 and S2 were used followed by finishing file F1 keeping in mind the manufactures guidelines. Ethylenediaminetetraacetic acid paste was used to smear the files before introducing them into the canal. 2 ml of 3% NaOCl was flushed into the canal during preparation. Paper points were used for drying the canals and were then obturated with F1 gutta-percha points which were coated with AH Plus sealer using single cone technique. The cavity was closed with cavity and teeth were stored in 100% moisture for 7 days. Two different rotary files were used for retreatment after 7 days and accordingly samples were divided into two groups as follows. With the help of Protaper retreatment files, the obturating material was removed from the canal. Removal from coronal third was done with D1 file while D2 file was used for removal from the middle and D3 to the working length. Mtwo retreatment files were used for removal of obturating material. Two files 15/0.5 and Mtwo retreatment file 25/0.5 were used up to the working length. 3% NaOCl was used for irrigation after removal of material from the canals. With 15 K-file mesiobuccal and distal root was re-measured with silicon stop adjusted to the reference point and distance from stop to the file tip was measured with Vernier Caliper to the closest to 0.5 mm. Two individuals repeatedly measured each tooth thrice and calculated its mean. Working length after removing the material was obtained by deducting 1 mm from the TL. With the help of radiographs amount of gutta-percha remained in the canal was calculated. Next, to the setting alginate, roots were embedded with their apical third submerged into the alginate and the lip clip of the apex locator was placed into the setting alginate so that the circuit of apex locator can be completed. These groups were further divided into subgroups. 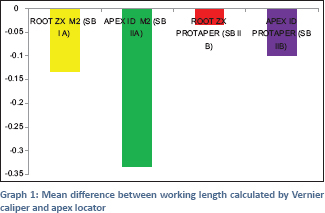 Root ZX apex locator was used for the measurement of working length. Apex ID apex locator was used for measuring the working length. For Root ZX apex locator, 15 # K file was used for the measurement of working length till the lowermost part of the green bar on the apex locator screen. For Apex ID apex locator measurements were taken when the display on the screen showed “0.” The length between the stopper and the file tip was measured and these readings for each tooth were repeated three times by two operators and the values were recorded. Complete procedure was performed within 2 h. These values were compared with the retreatment TL. Data were calculated in the tabulated form and was subjected to statistical analysis [Table 1]. ANOVA test was used to evaluate the values which revealed the mean difference values of SBIA, SBIIA, SBIB, SBIIB to be 0.93, 0.33, 0.03, 0.10 and the standard deviation for SBIA, SBIIA, SBIB, SBIIB be ± 0.21, ±0.40, ±0.12, and ± 0.02, respectively. These results were then evaluated with post hoc test which showed no significant difference in Apex ID with Mtwo retreatment files, but a significant difference was seen in the Root ZX apex locator and Protaper retreatment files. Difference of Apex ID with Mtwo retreatment files was −0.3000 with the value of P = 0.015 and that for Root ZX with Protaper retreatment files was −0.0100 with the value of P = 0.015 [Table 2]. [Graph 1] shows mean difference between working length calculated with Vernier Caliper and apex locator. [Graph 2] shows mean difference between working length calculated by Vernier calculated with Vernier Caliper and apex locator after retreatment of the tooth. Apex locator is based on the principle that certain features of human tissue can be designed using electrical components. Therefore, it is possible to detect the canal terminus, by measuring the electrical properties of the model. In number of studies performed on apex locator, teeth with single straight canals were used. We selected canals from mandibular molars so that more exacting model can be generated. Another reason was that mesiobuccal root of mandibular molar is more constricted, irregularly formed and is a complicated structure as compared to the teeth with the single canal. Reason for selecting the distal canal was to create standardization. 3% sodium hypochlorite was used to immerse teeth to remove soft- or hard-tissue tags present on the root surface. Crowns were removed to generate a horizontal reference point.,, Weiger et al. also focused on the preparation of a reference point and to consider the use of stable silicon stop. Access opening was done after preparing reference surface and working length was measured with the help of Vernier Caliper. The preparation of the root canal was done to the F1 Protaper universal file size. In the present study, Root ZX showed better results as compared to Apex ID, possibly because the residual root filling material occluding the dentinal tubules predisposes to a reduction in electrical conductivity and an increase in impedance, a factor potentially enhancing the electrical detection of the Apical File. Working length determined by the Root ZX before obturating the root canals and after removing the root fillings was not significantly different. The apex locators can be successfully used to determine the working length in endodontic retreatment. Under the conditions of our in vitro study Protaper retreatment files left significantly lesser gutta-percha and root canal sealer as compared to Mtwo retreatment files, and hence proved to be more efficient than Mtwo retreatment files. Under the parameters of this study Root ZX apex locator was more accurate as compared to Apex ID apex locator in determining the working length in teeth after removing the root canal obturating material. Nasil S, Asifulla M, Chandra V, Idris M, Razvi FS, Geeta IB.In vitro evaluation of the accuracy of five different electronic apex locators. Saudi Endod J 2015;5:177-81. Cimilli H, Aydemir S, Arican B, Mumcu G, Chandler N, Kartal N, et al. Accuracy of the Dentaport ZX apex locator for working length determination when retreating molar root canals. Aust Endod J 2014;40:2-5. Gordon MP, Chandler NP. Electronic apex locators. Int Endod J 2004;37:425-37. Shanmugaraj M, Nivedha R, Mathan R, Balagopal S. Evaluation of working length determination methods: An in vivo/ex vivo study. Indian J Dent Res 2007;18:60-2. Masiero AV, Barletta FB. Effectiveness of different techniques for removing gutta-percha during retreatment. Int Endod J 2005;38:2-7. Tilakchand M, Malu KN, Kidiyoorc KH. Evaluation of accuracy of two electronic apex locators Viz Propex-II and elements apex locator: An in-vitro study. IJDA 2010;2:327-31. Santhosh L, Raiththa P, Aswathanarayana S, Panchajanya S, Reddy JT, Susheela SR, et al. Influence of root canal curvature on the accuracy of an electronic apex locator: An in vitro study. J Conserv Dent 2014;17:583-6. Weiger R, John C, Geigle H, Löst C. An in vitro comparison of two modern apex locators. J Endod 1999;25:765-8. Pereira AC, Nishiyama CK, Pinto LC. Single cone obturation technique: A literature review. RSBO 2012;9:442-7. Sadr S, Golmoradizadeh A, Raoof M, Tabanfar MJ. Microleakage of single-cone gutta-percha obturation technique in combination with different types of sealers. Iran Endod J 2015;10:199-203. Katalinić I, Baraba A, Glavicić S, Segović S, Anić I, Miletić I, et al. Comparison of vertical forces during root canal filling with three different obturation techniques. Coll Antropol 2013;37:895-9. Pitout E, Oberholzer TG. Leakage of teeth root-filled with guttaFlow and a single GP cone compared to lateral condensation and warm vertical condensation. SADJ 2009;64:104, 106-8. Nunes VH, Silva RG, Alfredo E, Sousa-Neto MD, Silva-Sousa YT. Adhesion of epiphany and AH plus sealers to human root dentin treated with different solutions. Braz Dent J 2008;19:46-50. Ozok AR, van der Sluis LW, Wu MK, Wesselink PR. Sealing ability of a new polydimethylsiloxane-based root canal filling material. J Endod 2008;34:204-7. Fisher MA, Berzins DW, Bahcall JK. An in vitro comparison of bond strength of various obturation materials to root canal dentin using a push-out test design. J Endod 2007;33:856-8. Ungor M, Onay EO, Orucoglu H. Push-out bond strengths: The epiphany-Resilon endodontic obturation system compared with different pairings of Epiphany, Resilon, AH plus and gutta-percha. Int Endod J 2006;39:643-7. Gesi A, Raffaelli O, Goracci C, Pashley DH, Tay FR, Ferrari M, et al. Interfacial strength of resilon and gutta-percha to intraradicular dentin. J Endod 2005;31:809-13. Wilcox LR, Juhlin JJ. Endodontic retreatment of thermafil versus laterally condensed gutta-percha. J Endod 1994;20:115-7. Erdemir A, Eldeniz AU, Belli S, Pashley DH. Effect of solvents on bonding to root canal dentin. J Endod 2004;30:589-92. Marfisi K, Mercade M, Plotino G, Duran-Sindreu F, Bueno R, Roig M, et al. Efficacy of three different rotary files to remove gutta-percha and resilon from root canals. Int Endod J 2010;43:1022-8. Alothmani OS. The accuracy of Root ZX electronic apex locator. Saudi Endod J 2012;2:115-28. Welk AR, Baumgartner JC, Marshall JG. An in vivo comparison of two frequency-based electronic apex locators. J Endod 2003;29:497-500. Chirila M, Scarlatescu SA, Nistor CC, Moldoveanu GF. The accuracy of working length determination during endodontic retreatment. J Oral Rehabil 2011;3:63-7.